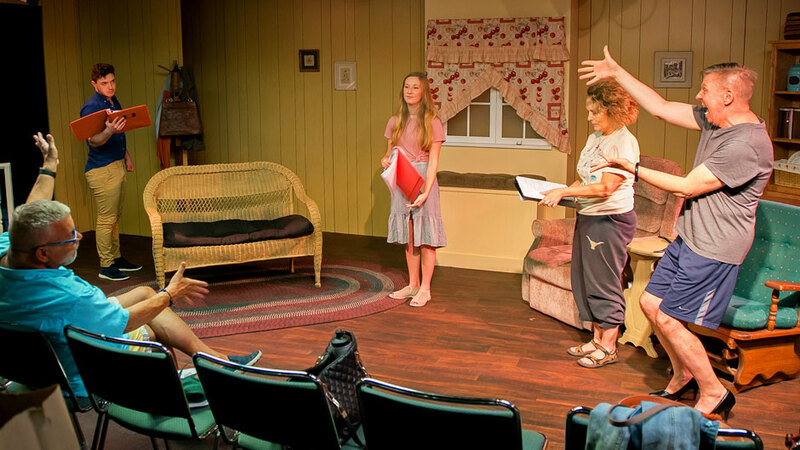 Actors appearing in the premiere of Aunt Jack, including three UM graduates, rehearse in Fort Lauderdale. Photos: Evan Garcia/UM News. Three recent UM musical theatre graduates star in the world premiere of new play in Fort Lauderdale. FORT LAUDERDALE, Fla.—As Aunt Jack moved from page to stage last week, director Michael Bush was concerned about setting the proper comedic tone for the new play that opens with a death in the family of a drag superstar. But for Bush, the artistic director of the University of Miami’s Jerry Herman Ring Theatre who joined the Department of Theatre Arts as guest director in 2016, there was no real pain on stage. There was only the unadulterated joy that comes from watching three recent UM musical theatre graduates shine in one of Aunt Jack’s lead and two supporting roles. To Bush’s immense delight and by his own doing, Daniel Barrett, Shannon Booth and Bobby Eddy, who all earned their Bachelor of Fine Arts degrees in May, make up half the cast of the small play with a big message about sexuality, identity and family. Written by New York playwright S.P. Monahan, it premieres at Empire Stage on July 19 and runs through August 12. The feeling is more than mutual for the three actors and a fourth UM alumna, Kelly Zahnen, who as Aunt Jack’s production stage manager essentially runs the show. All four ’Canes count themselves as fortunate to be mentored by Bush, who has worked with the likes of Julie Andrews and Bernadette Peters over his illustrious career, as they are to land roles in the world premiere of Monahan’s new charmer. Starring veteran New York actor Charles Baran in the title role, Aunt Jack centers on Jack’s stepson Norman who, after months of silence, returns home to his famous and famously gay fathers with an unexpected new partner. Last Thursday, as Zahnen, who is earning her fifth professional credit, sat behind Bush, keeping track of the script, cuing missed lines, and calling breaks, she and the cast still had a lot of imagining to do. Rather than the sunken living room in the stylized apartment in New York’s West Village where Aunt Jack takes place, they practiced their dialogue, movements and timing in a drab, old apartment—the backdrop for another play currently running at the Empire Stage. Yet with just half of Aunt Jack on its feet, Bush was already seeing the right comedic tone emerge in the tiny venue that has launched a number of national LGBTQ-themed hits. He was hardly surprised. Tickets for Aunt Jack, which also stars veteran actors Merry Jo Cortada and Harry Redlich, are available through the Empire Stage.